« Could A Contempt of Court in Georgia Lead to an Obama Impeachment? Here it is, folks! The document we have been waiting for! 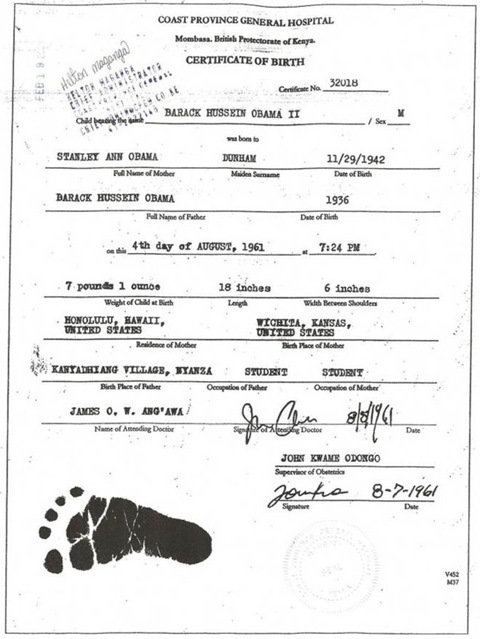 Now what, Supreme Court?Widely circulated; challenge to Obama’s birthplace and to US Citizenship. Seems this is bound to arise [again] in the “political diatribe” of the coming year! Whether we like it – believe it – or disbelieve it. Well, well, well . at last the ‘real’ thing. Now, what will happen? Whom do you believe? This man should be impeached-now! Now if only someone in Congress or the Supreme Court will act on this! Here’s a close-up of the top of the document where you can plainly read his name and his parents’ names, etc…. After only a few minutes of research, he called back and said “Sir Edward F. Lavender. Note the same name near the bottom of the photo above. 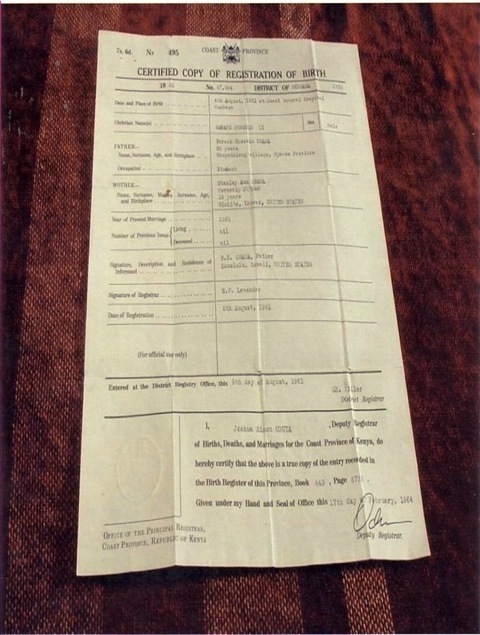 The above document is a “Certified Copy of Registration of Birth,” but below is a copy of the actual Certificate of Birth – the real-deal legal kind of certificate. 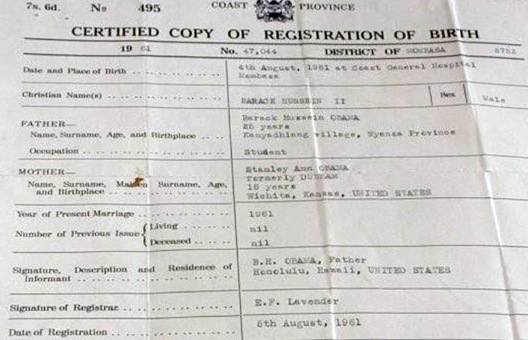 The local Muslim Imam in Mombasa named Barack with his Muslim middle name Hussein so his official name on this certificate is Barack Hussein Obama II. The grandmother of Barack Hussein Obama, Jr. reveals the story of his birth in Mombasa, Kenya, a seaport, after his mother suffered labor pains while swimming at ocean beach in Mombasa. “On August 4, 1961 Obama’s mother, father, and grandmother were attending a Muslim festival in Mombasa, Kenya. His mother had been refused entry to airplanes due to her nine-month pregnancy. It was a hot August day at the festival so the Obamas went to the beach to cool off. 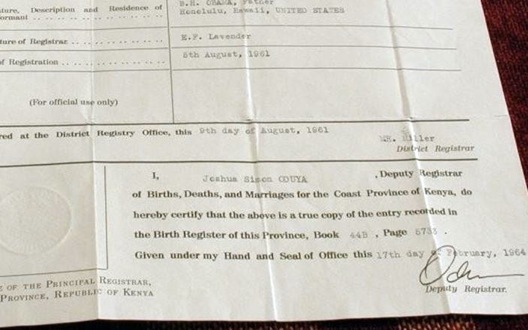 While swimming in the ocean his mother experienced labor pains so was rushed to the Coast Provincial General Hospital, Mombasa, Kenya where Obama was born a few hours later at 7:21 pm on August 4, 1961(what a sad day for the USA!). “I happen to be Kenyan. 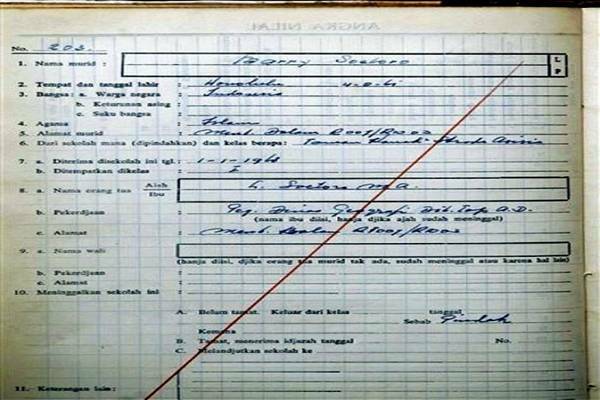 I was born 1 month before Obama at Mombasa medical center. I am a teacher here at the MM Shaw Primary School in Kenya. I compared my birth certificate to the one that has been put out by Taitz and mine is exactly the same. I even have the same registrar and format. The type is identical. I am by nature a skeptical person. I teach science here and challenge most things that cannot be proven. So I went to an official registrar today and pulled up the picture on the web. They magnified it and determined it to be authentic. There is even a plaque with Registrar Lavender’s name on it as he was a Brit and was in charge of the Registrar office from 1959 until January of 1964. The reason the date on the certificate says republic of Kenya is that we were a republic when the “copy” of the original was ordered. I stress the word “copy.” My copy also has republic of Kenya. So what you say is true about Kenya not being a republic at the time of Obama’s birth, however it was a republic when the copy was ordered. This registration document, made available on Jan. 24, 2007, by the Fransiskus Assisi school in Jakarta, Indonesia , shows the registration of Barack Obama under the name Barry Soetoro made by his step-father, Lolo Soetoro. In a move certain to fuel the debate over Obama’s qualifications for the presidency, the group “Americans for Freedom of Information” has released copies of President Obama’s college transcripts from Occidental College. To qualify for this scholarship, a student must claim foreign citizenship. Mr. Kreep indicated that the investigation is still on-going but that the final report will be provided to the U.S. attorney general, Eric Holder. Mr. Holder has refused comment on this matter. Let other folks know this news – the media won’t! This entry was posted on February 2, 2012, 9:20 pm and is filed under Current Events, Exposing The Truth, Uncategorized. You can follow any responses to this entry through RSS 2.0. Both comments and pings are currently closed. So what is the big deal about the birth certificate?? yea its a big deal but hey no one refutes that his dad never was and never has been an citizen.. so he is not natural born.. Both parents must be citizens or not a Natural Born.. It makes sense, could you let the most powerful person who may have ti invade a country and other political decisions would be impacted if of of his parents was a citizen (having allegiance to another country) now would you.. that is why that is one of the requirements.. Hello!! so there is a foreigner in the CEO position of a foreign corporation.. what’s the problem? What the problem is is that the foreign corporation is impersonating our true de jure Government, Constitutional government not the Banksters corporate lying cheating, stealing pretender government corporation… wakie wakie… time t wake up sleeple. The Federal Reserve is a Foreign Private Bank, etc……. Truthmonger makes a truthful point! Way to go!! The point truthmonger makes is not only true but is the tip of the iceberg. George Washington was not a 14 year citizen required by the Constitution. The United States of America was created by the Declaration of Independence of 1776. Washington became President in 1789 one year shy of the 14 year requirement set out in Article II section 1 clause 5. I know what your going to say…he was born in America. He was born on the American continent. By written law, the United States of America, the country, wasn’t created until 1776. One can’t be a citizen to a country that wasn’t created. Prior to 1776, the continent was known as the United Colonies of the British Empire. How did George Washington get away with it? For that you must heavily scrutinize and read as one the four organic laws of this country as noted and recognized in Title 1 of the US Code. In order, they are: The 1776 Declaration of Independence, The Articles of Confederation of 1777, The Northwest Ordinance of 1787, and The 1787 Constitution for The United States of America. Pay close attention to what the words Congress, In Congress Assembled, and United States of America mean as they shape shift through these documents. It will uncover hidden truths about these documents that are clearly written in plain view. When a person unlocks these truths, it is clear that it doesn’t matter if Obama is a citizen or not. Those arguing this point are falling right in line with the design of the controversy itself. It is a diversion and the sheeple fall for it every time. Everything we know and have been taught about the Constitution is a lie. Scholars alike have been fooled. If the Constitution was adopted, which it wasn’t, it would have replaced the Articles of Confederation like we’ve been taught. If the Articles of Confederation were replaced and the United States didn’t follow them, why are they listed as the law according to USC Title 1? Think about it, do your own research…not your history teacher’s, the history channel’s, the encyclopedia’s, your professor’s research, or anyone else and wake up!